DAVID Cameron has resigned as Prime Minister. The British PM made the announcement in a Downing Street speech this morning after Britain voted to leave the European Union in Thursday’s referendum. Cameron stated he will remain as PM until October. With his voice clearly breaking, Cameron pledged that British people living in European countries would see ‘no immediate changes to their circumstances’. “The British people have made a clear decision to take a different path and as such I think the country requires fresh leadership to take us in this direction,” said Cameron. “I will do everything I can as Prime Minister to steady the ship over the coming weeks and months. But I do not think it would be right for me to be the captain that steers our country to its next destination. “This is not a decision I have taken lightly, but I do believe it is in the national interest to have period of stability. Earlier, Labour MP Keith Vaz called the decision to leave the EU ‘catastrophic’. Vaz said: “Frankly, in a thousand years I would never have believed that the British people would have voted this way. “And they have done so and I think that they voted emotionally rather than looking at the facts. 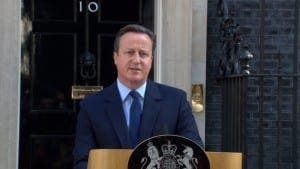 During his emotional speech, Cameron said the ‘will of the British people must be respected’. He added: “The country has just taken part in a giant democratic victory, perhaps the biggest in our history. “Over 33 million people from England, Scotland, Wales, Northern Ireland and Gibraltar have all had their say. The will of the British people must be respected. “I can reassure Brits living in European countries and European citizens living here that there will be no immediate changes in your circumstances. My god you are more biased than the BBC ! Spain has enjoyed the gravy train to long funded by the French , Dutch , Germans and British . What’s up ? Scared you might have to pay your own bills now .